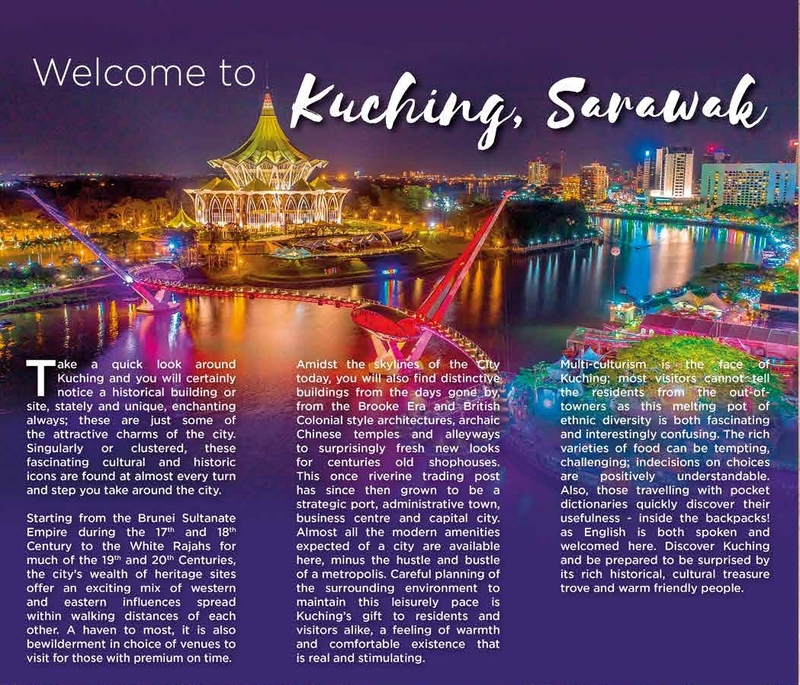 Take a quick look around Kuching and you will certainly notice a historical building or site, stately and unique, enchanting always; these are just some of the attractive charms of the city. Singular or clustered, these fascinating cultural and historic icons are found at almost every turn and step you take around the city. 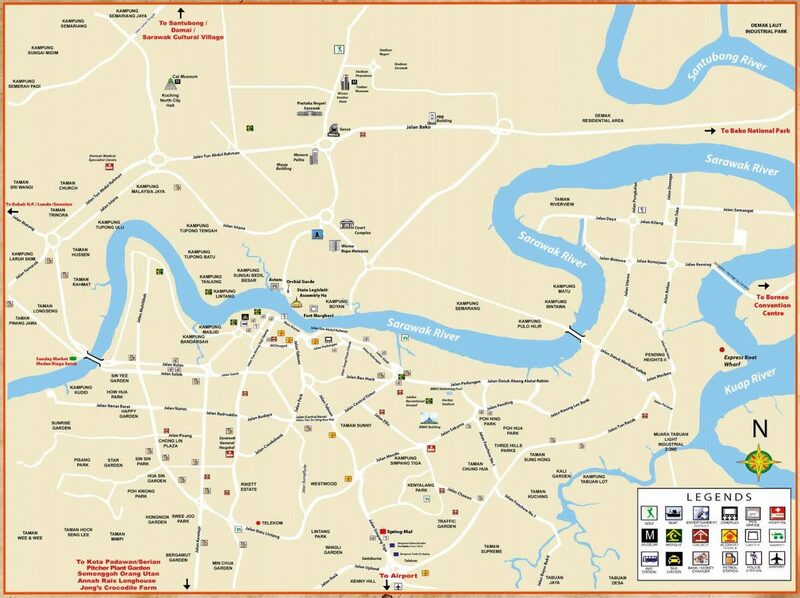 Starting from the Brunei Sultanate Empire during the 17th and 18th Century to the White Rajahs for much of the 19th and 20th Centuries, the city’s wealth of heritage sites offer an existing mix of western and eastern influences spread within walking distance of each other. 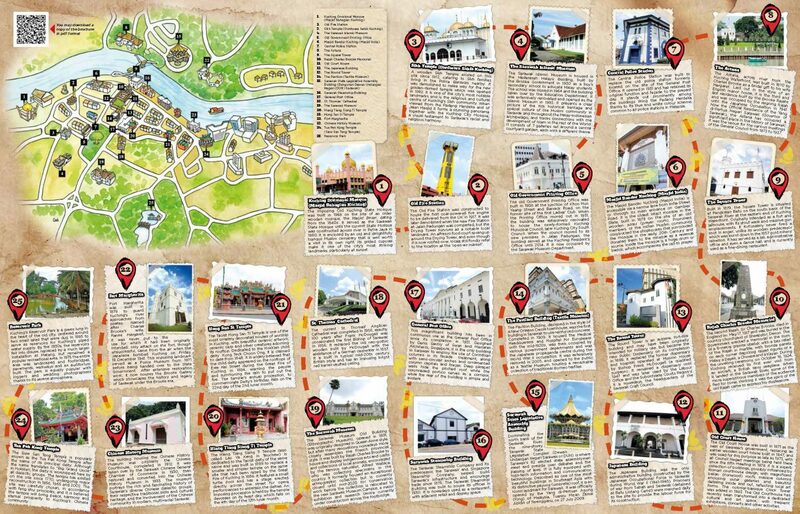 Download a printable version of the Old Kuching Heritage Trail here. Kuching Divisional Mosque – The imposing Old Kuching State Mosque was built in 1968 on the site of an old wooden mosque, the Masjid Besar, dating from the 1840s. It served as the Sarawak State Mosque until the current State Mosque was constructed across river in Petra Jaya in 1990. It is enclosed by an old and delightfully tranquil Muslim cemetery that is well worth as a visit in its own right. Its gilded cupolas make it one of the city’s most striking landmarks, particularly at sunset. The Old Fire Station was constructed to house the first coal-powered fire engine to be delivered from the UK in 1917. 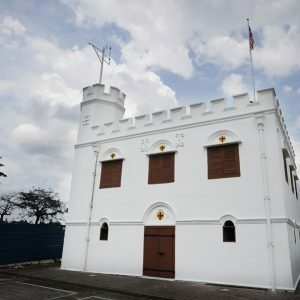 It was later demolished when the new Fire Station at Jalan Padungan was completed, but the Drying Tower survives as a notable local landmark. 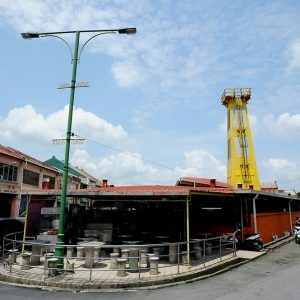 An alfresco food court sprang up around the Drying Tower, and even though it is now roofed-over, locals still fondly refer to the location as the “open-air market’. Gurdwara Sahib Sikh Temple – A wooden Sikh Temple existed on this site since 1912, catering to Sikh families living in the Police Barracks nearby. It was demolished to make way for the new golden-domed temple which was opened in 1982. 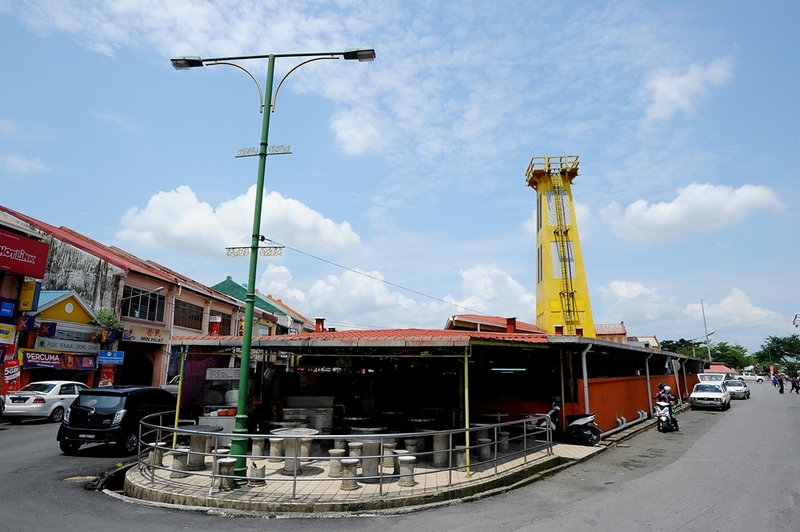 It is one of the city’s most notable landmarks and is the religious and cultural centre of Kuching’s Sikh community. When viewed from the Padang Merdeka end of Jalan Masjid it forms a stunning panorama together with the Kuching City Mosque, a visual testament to Sarawak’s racial and religious harmony. 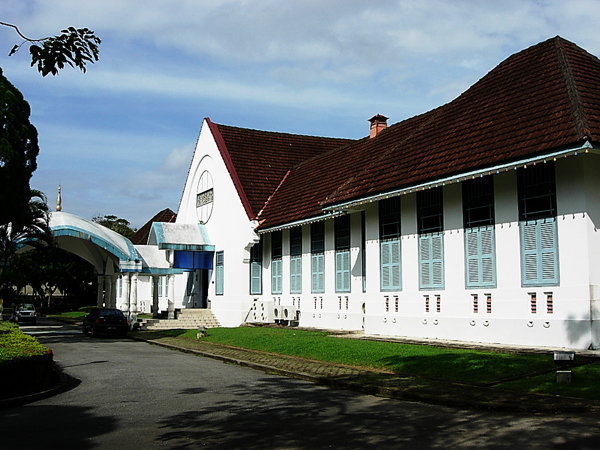 The Sarawak Islamic Museum is housed in the Maderasah Melayu Building, build by the Brooke Government in 1930 as a boy’s she secondary school to educate Malay students. The school was closed in 1964 and the building taken over by Education Department. It was extensively renovated and opened as the Islamic Museum in 1992. 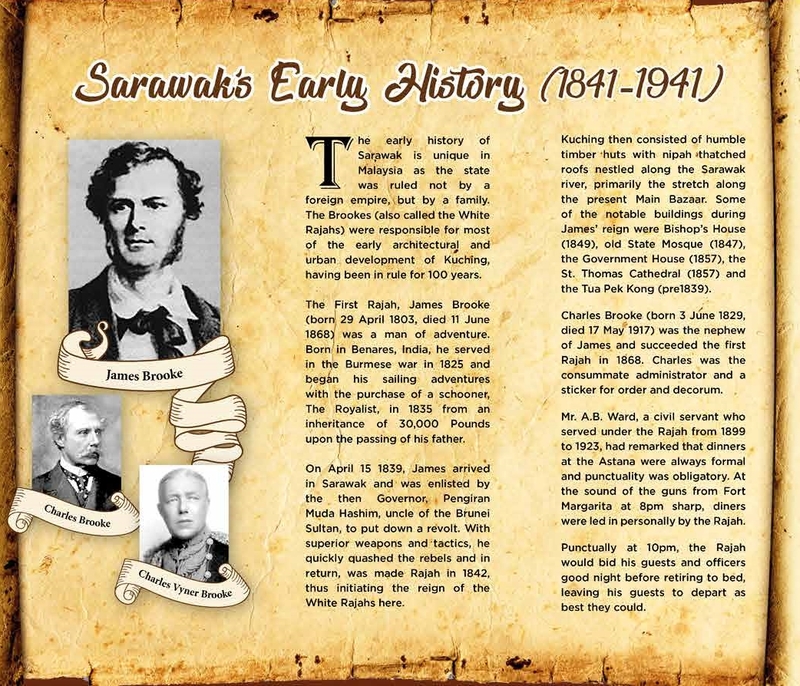 It presents a clear picture of the rich historical heritage and special culture of the Muslim community in Sarawak and throughout the Malay-Indonesian archipelago, and traces connections with the development of Islam in the rest of the World. It consists of 7 galleries set around a central courtyard garden, each with a different theme. 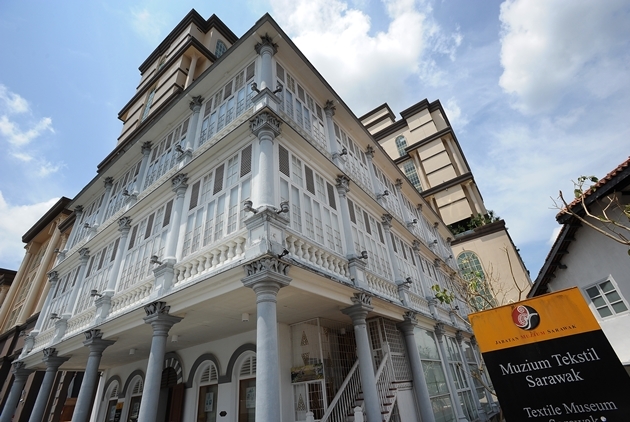 The Old Government Printing Office was built in 1908 at the junction of Khoo Hu Yeang Street and Barrack Road, on the former site of the first Ladies’ Club. 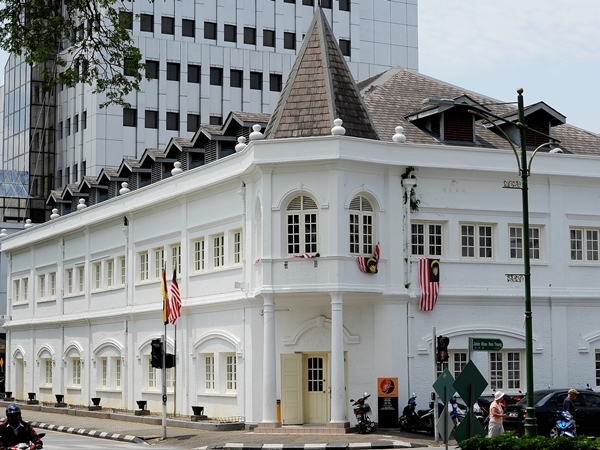 When the Printing Office moved out in 1951, the building was extensively renovated to house the newly-formed Kuching Municipal Council, later Kuching City Souths Council. 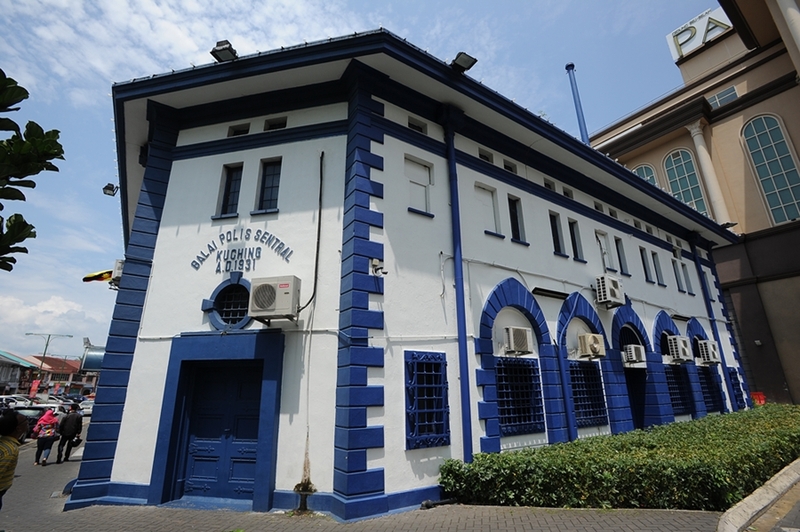 When the council moved to it new premises in Jalan Padungan, the building served as the Kuching Resident’s Office until 2014. 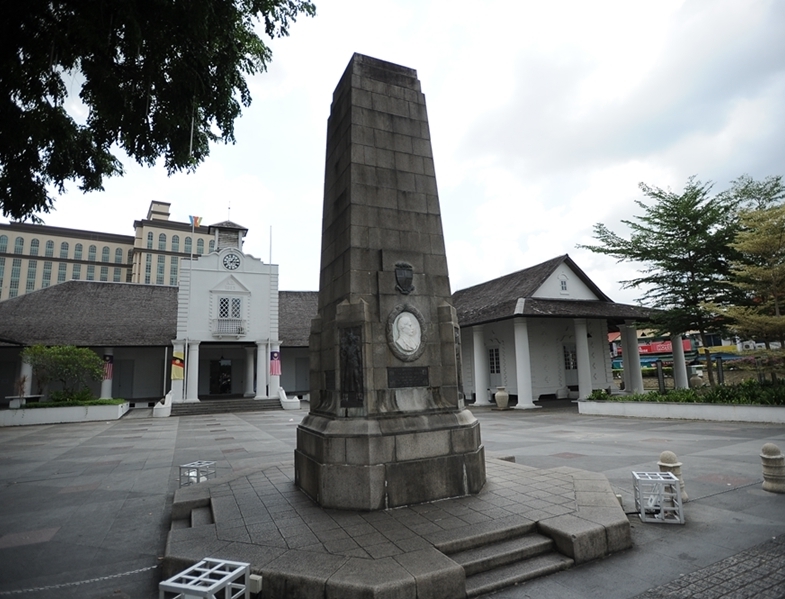 It is now occupied by the Sarawak Museum Department. 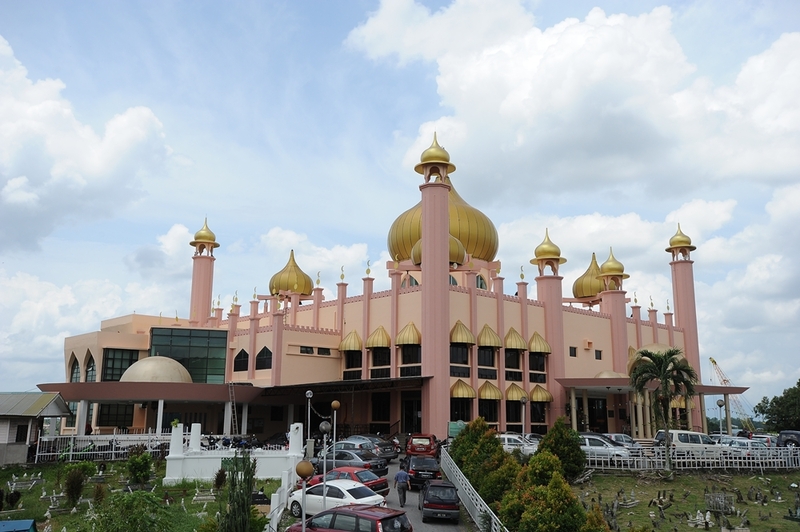 Masjid Bandar Kuching (Masjid India) – The Masjid Bandar Kuching (Masjid India) is accessible via a narrow lane from India Street or through its main entrance on Gambier Road. It is the oldest intact mosque in the State, built in 1876 on the site of an old wooden surau (prayer room). Prominent members of the Indian Muslim community constructed the shophouses that surrounded the mosque in the early 20th Century and donated them to the mosque as a revenue source. Inside the mosque is a huge drum or bedok, which accompanies the call to prayer. 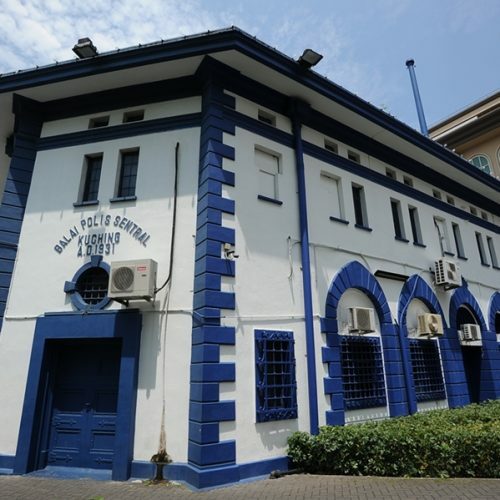 The Central Police Station was built to replace the old police station formerly located on the site of the General Post Office. It opened in 1931 and has retained its original function and façade to the present day. 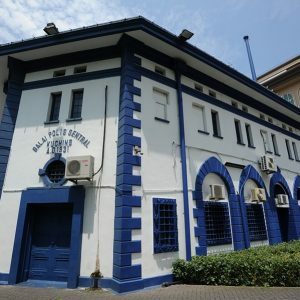 It stands out prominently among the building lining the Padang Merdeka thanks to its blue and white colour scheme, common to all police stations in Malaysia. 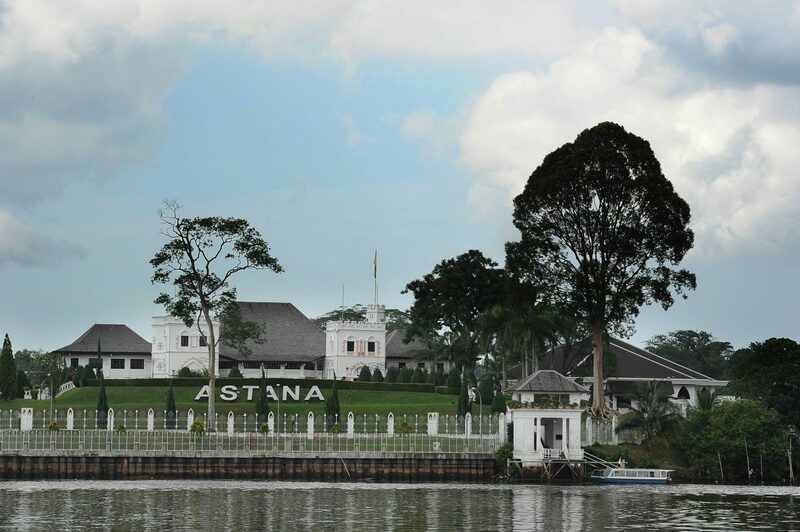 The Astana, across river from the Kuching Waterfront, was built in 1870 by Charles Brooke as a bridal gift to his wife Margaret. Laid out in the style of an English manor house, it is the third and last residence built by the Brooke Rajahs and was occupied by the reigning Rajah until the Japanese Occupation in 1941. 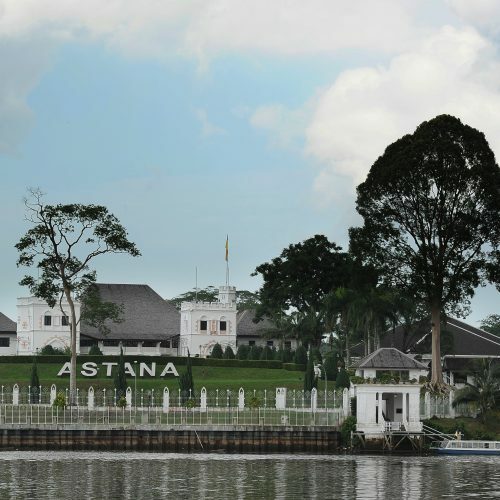 The Astana has occupied a significant place in the history of Sarawak; it was the venue for the various meetings of the General Council from 1873 to 1937. Built in 1879, the Square Tower is situated at Pangkalan Batu on the south bank of the Sarawak River at the eastern end of Kuching Waterfront. Originally intended as a fort and jailhouse, with its stout walls and massive fire gun emplacements, it fortunately never fires a shot in anger, unlike its wooden predecessor which was burnt down in the 1857 gold miners’ rebellion. It has served as a jail, administrative office and even a dance hall, and is currently used as a fine-dining restaurant. Rajah Charles Brooke Memorial – The second Rajah, Sir Charles Brooke, died in the England on May 17,1917 and was buried in the country churchyard of Sheepstor, Devon. 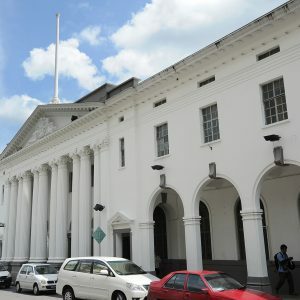 The Old Court House was built in 1871 as the seat of Sarawak’s government, replacing an earlier wooden court house built in 1847, and was used for this purpose as late as 1973, with all Council Negeri meetings being held there since the fifth meeting in 1878. It is a superb collection of buildings, possibly influenced by Roman courthouse design, with magnificent belian (ironwood) roofs, massive columns enclosing outer galleries and beautiful detailing inside and out, reflecting local art forms. The colonial-baroque Clock Tower was added in 1883. The Old Courthouse has recently been transformed into a dedicated cultural and art space, with frequent exhibitions, concert and other activities. 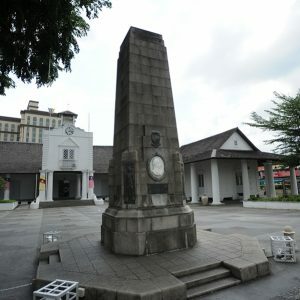 The Japanese Building was the only administrative building constructed by the Japanese Occupational Force in Sarawak during World War II (1941-1945). Prisoners of war from Sabah and Sarawak (detained at Batu Lintang Camp) were marched daily to the site to provide the labour force for its construction. The Round Tower is an austere, fort-like building and may have been originally intended for military use, but became the new Public Dispensary on its completion in 1886. It replaced the former dispensary and hospital operated at Mission House by Bishop Frank McDougall (a qualified surgeon). It remained a dispensary until 1947 and was later used by the Labour Office and the Subordinate Courts Registry. 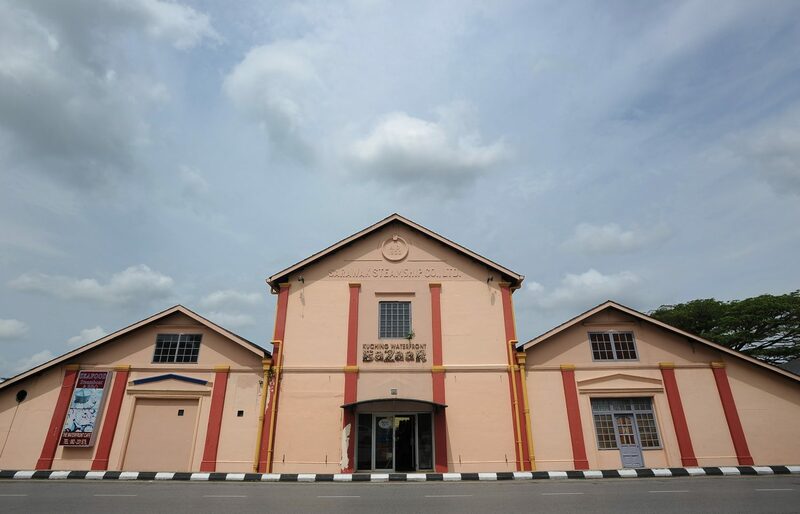 It is nowadays, the headquarters of the Sarawak Craft Council. The Pavilion Building, designed in the style of the New Orleans Creole townhouse, was the first building in Sarawak to use reinforced concrete. Completed in 1909, it housed the Medical Headquarters and Hospital for Europeans until the mid-1920s, was then occupied by various government departments and was the Japanese propaganda centre during the World War II occupation. It was extensively restored in 2005, and opened a to the public as a Textile Museum, housing remarkable collection of traditional Borneo textiles. Sarawak State Legislative Assembly Building – Dominating the north bank of Sarawak River, the nine-storey Sarawak State Legislative Complex (Dewan Undangan Negeri Sarawak or DUN) is where Sarawak’s 82 elected state assemblymen meet and preside over debates and the passing of laws. It is fully equipped with high-tech information and communication technology. 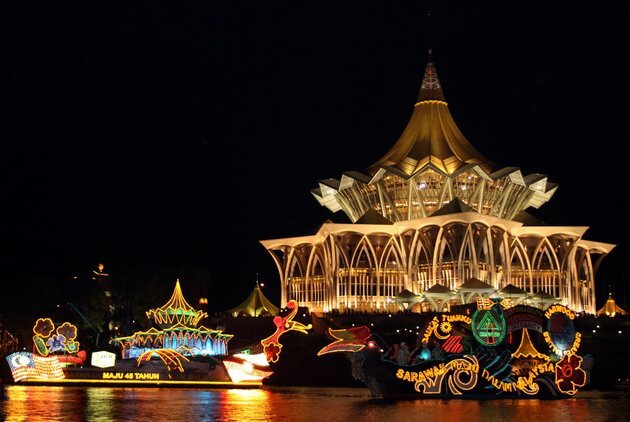 Described as one of the most Asia beautiful buildings in Southeast Asia with its distinctive payung (umbrella) roof, it is an iconic landmark for Sarawak. It was officially opened by the Yang di-Pertuan Agong (King) of Malaysia, Tuanku Mizan Zainal Abidin of Terengganu, on 27 July 2009. 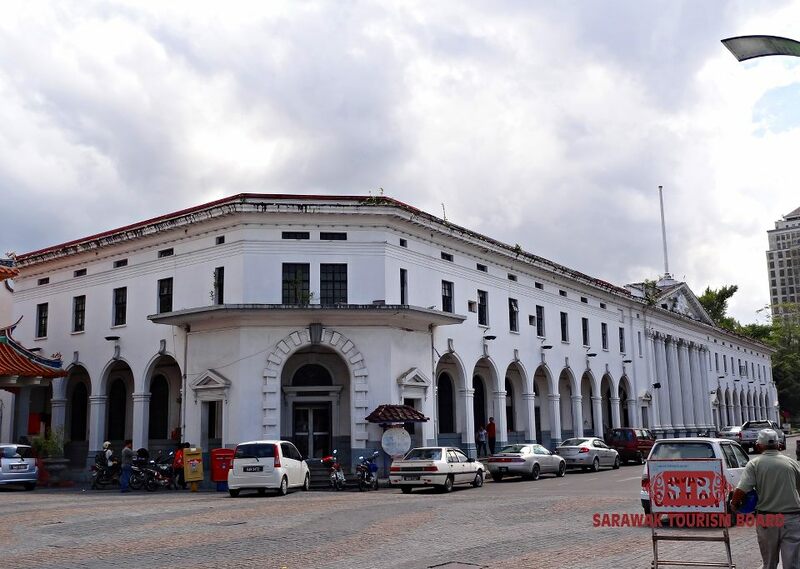 Sarawak Steamship Building – The Sarawak Steamship Company and its predecessor, the Sarawak and Singapore Steampship Company, helped build Sarawak’s infrastructure and encourage trade since 1875. 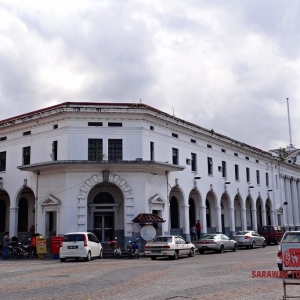 The Sarawak Steamship Building was built to house its offices in 1930. It is nowadays used as a restaurant, with adjacent retail and display space. 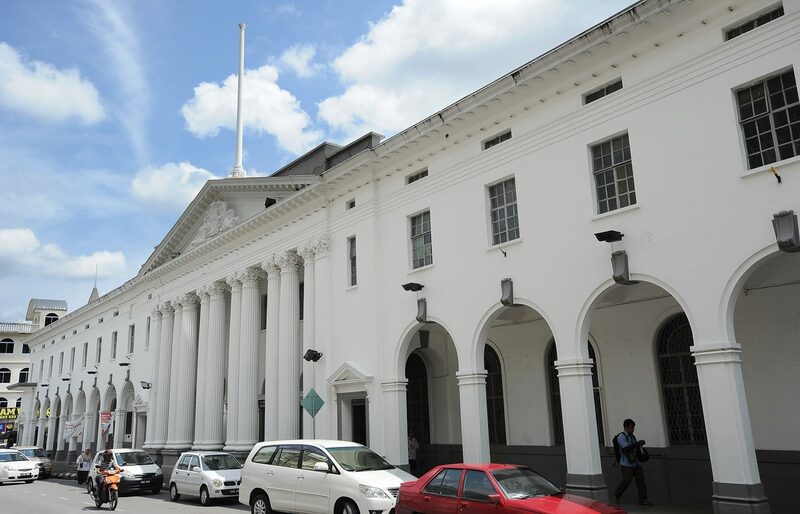 This magnificent building has been in continuous use as the General Post Office since its completion in 1931. Designed by Denis Santry of Swan and Maclaren Architects, Singapore, it is the only building in Sarawak to employ the use of Corinthian columns in its facade treatment, along with semi-circular arches and ornamented column capitals and friezes. Deep parapet walls hide the pitched roof while the colonnaded portico serves as a corridor, while the rear of the building is simple and austere. St. Thomas’ Cathedral – The current St. Thomas’ Anglican Cathedral was completed in 1956. exactly 100 years after Frank McDougall was consecrated the first Bishop of Sarawak in 1856. It replaced the old neo-gothic wooden built by McDougall with assistance of a German carpenter in 1857. It is built in typical mid-20th century British style and has and imposing bright red barrel-vaulted ceiling. 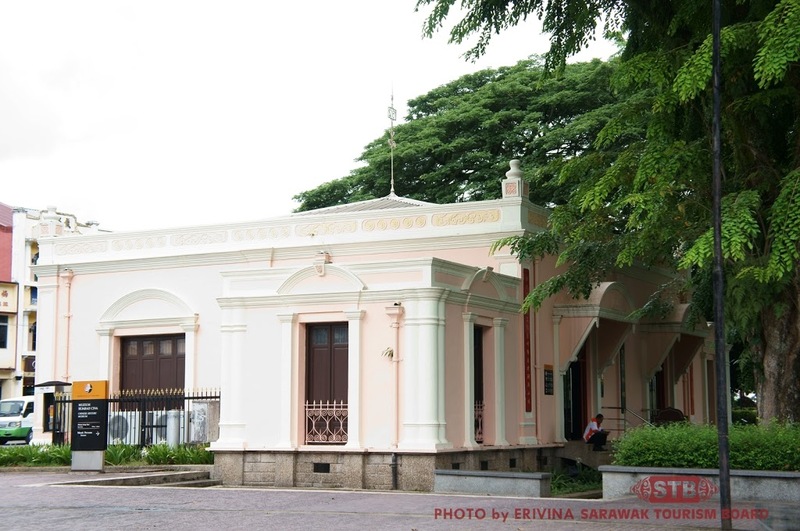 The Sarawak Museum Old Building, opened in 1891, was originally designed in Queen Anne style but after renovations nowadays more closely resembles the French provincial style. 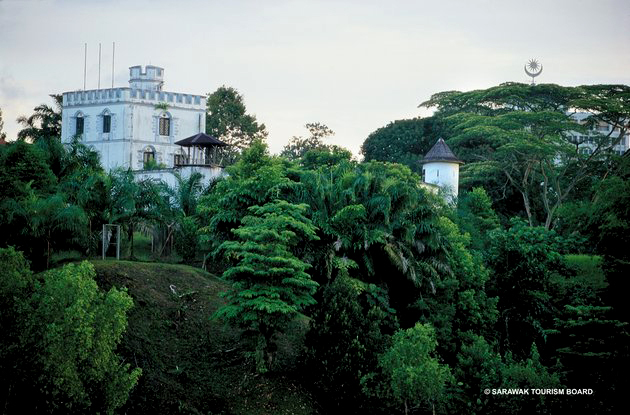 It was built by Rajah Charles Brooke to house and display indigenous arts and crafts and collections of local animals, encouraged by the famous naturalist, Alfred Wallece, who was collecting specimens in the country. 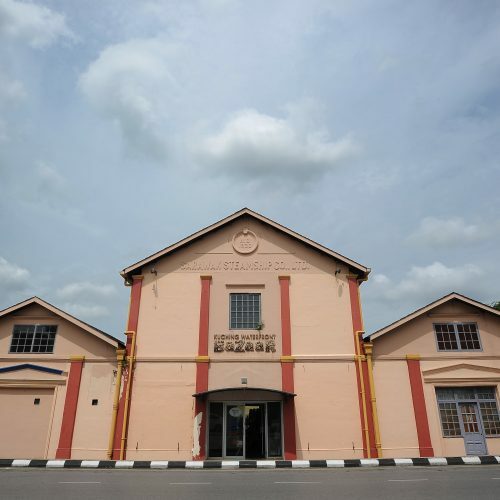 It formerly housed an exceptional ethnographic collection but is currently closed until mid-2020 for conservation work before the collection is relocation to the new Sarawak Museum Campus, a major exhibition and reseach centre currently under construction across footbridge. The Hiang Tiang Siang Ti Temple is dedicated to the Taoist deity of the same name and was built in 1889 to replace a smaller and simpler temple on the same site that had been razed by the Great Fire of Kuching in 1884. It features a small turtle pool and has a stage for opera performances to entertain the deities. an imposing procession is held by the temple devotees on its feast day, which falls on the 4th day of the 12th lunar month. Hong San Si Temple – The Taoist Hong San Si Temple is one of the most ornately decorated houses of worship in Kuching, with beautiful ceramic artwork, ceramic carp and other creatures adorning its rooftop. Dedicated to the Hokkien child deity Kong Teck Choon Ong, it is claimed to date from 1848. It is widely believed that the child deity appeared on the rooftops of Ewe Hai Street during the Great Fire of Kuching in 1884, warning the people and summoning the rain to put out the fire. The temple’s annual procession, to commemorate Deity’s birthday, falls on the 22nd day of the 2nd lunar month. 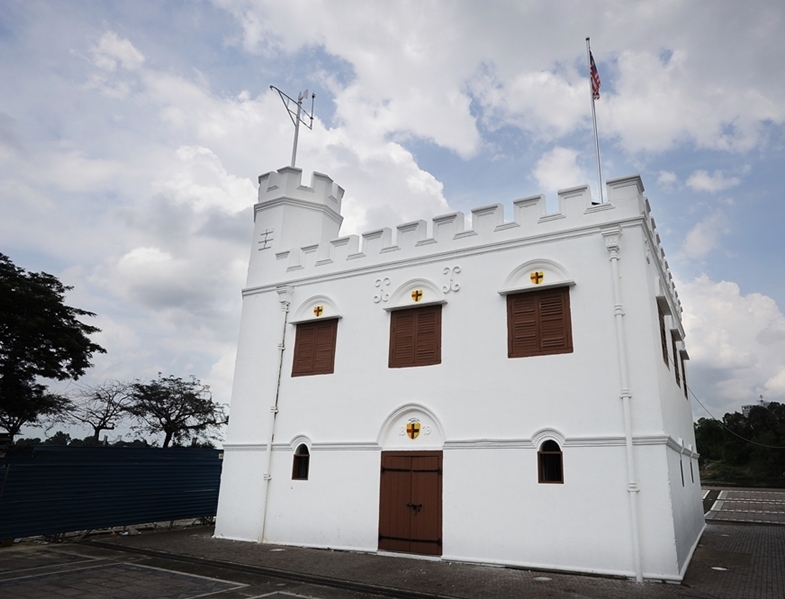 Fort Margherita was built in 1879 to guard Kuching’s river approaches from pirates. Named after Charles Brooke’s wife, Ranee Margaret, it was never put to the use for which it had been originally intended; only attack on the fort, though unsuccessful, came from the air when the Japanese bombed Kuching on Friday, 19 December 1941. This imposing from 1971 served as a Police Museum from 1971 before being handed over to the State Government. 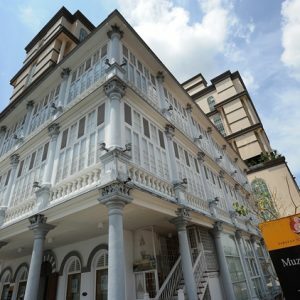 After extensive restoration work, it now houses the Brooke Gallery which showcases the history and legacy of Sarawak under the Brooke era. The building housing the Chinese History Museum was originally the Chinese Courthouse, completed in 1912. 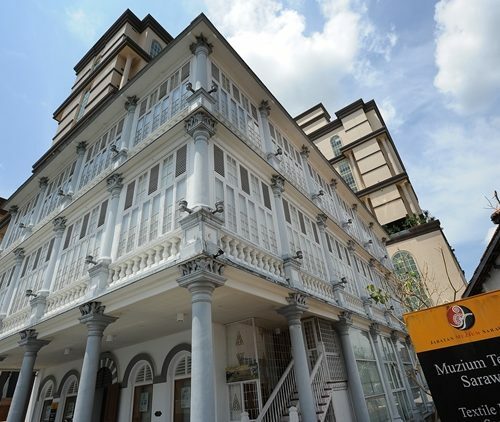 It was taken over by the Sarawak Chinese General Chamber of Commerce in 1930, then restored and converted into the Chinese History Museum in 1993. The museum portrays the rich and fascinating history of Sarawak’s diverse Chinese dialectic groups, their respective traditional skills and cultural heritage, and the involvement of the Chinese community in modern, multi-racial Sarawak. Tua Pek Kong Temple – The Siew San Temple is popularly known as the Tua Pek Kong Temple after the name of its principal deity. Although the name translates to “Bing Grand Uncle” in Hokkien, the deity is worshipped here by all dialectic groups. The temple has existed on this site since 1770, undergoing major reconstruction in 1856, 1965, and 2002. The site was carefully chosen, in accordance with feng shui principles, and it is believed the temple will bring peace, harmony and eternal prosperity to Kuching’s Chinese community. Kuching’s Reservoir Park is a green lung in the heart of the old city, centered around two small lakes that were dug in 1895 to serve as reservoirs for Kuching’s piped water supply. By the 1930s, the reservoirs fell into disuse, replaced by a much larger installation at Matang, but remained a popular recreational area. In 1975 the entire area was landscaped and footbridges, pavements, walkways and an auditorium built. The park is equally popular with joggers and wedding photographers thanks to its serene atmosphere.